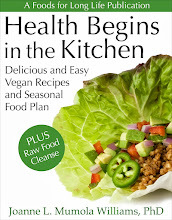 Foods For Long Life: It's Time To Make Serrano Pepper Hot SauceSalsa Picante Makes A Great Holiday Gift! Salsa Picante Makes A Great Holiday Gift! 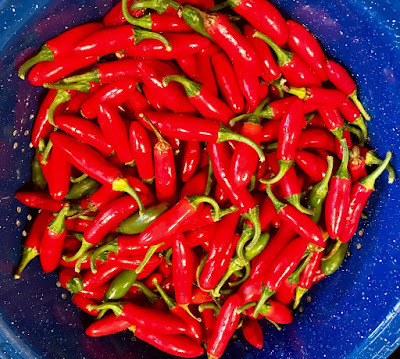 Turn those garden Serrano peppers into hot sauce. Fall in Northern California is generally the time to pull out your summer crops and plant broccoli, kale, beets, lettuce, garlic, and other winter crops. The one plant that is still in the ground, however, and that's always late to produce is our pepper crop. 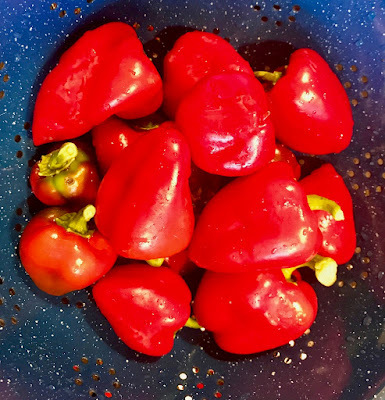 But now it's time to pick them before the weather turns bad so I picked all the serrano peppers and most of the red pimento and poblano peppers. But what do you do with 3 pounds of serranos when only one is needed to flavor a dish? Well, let's make hot sauce! I blogged a hot sauce recipe a few years ago using jalapeños and serranos but this year I'm using serrano peppers combined with a sweet red pimento pepper. It's still turned out super hot, but the sweet pepper cut the heat a little bit and gave it a nice flavor. Sweet red pimento peppers cut the heat a bit and adds a lovely flavor to the hot sauce. This recipe makes a lot of hot sauce (10 cups) so feel free to cut it down. Or, if you have lots of serranos and want to make this big a batch, fill some cute little bottles and give them away as holiday presents. Cut the tops off the serrano peppers. Then, cut them down the middle lengthwise. Set aside. Remove the tops and the inner seeds from the sweet peppers. Dice and set aside. Heat the oil on medium heat and cook the onions and garlic for 5 minutes, stirring frequently. Stir in the serrano and red peppers along with the salt and cook, stirring frequently, for 10 minutes. Cook until almost dry but not completely. Unless you have a really big blender, you will have to blend in two batches. Place half the cooked peppers and half the vinegar in a blender and process until smooth. Repeat with the rest of the peppers and vinegar. Unless you have a 12 cup blender, you will have to process the peppers and vinegar in two batches. 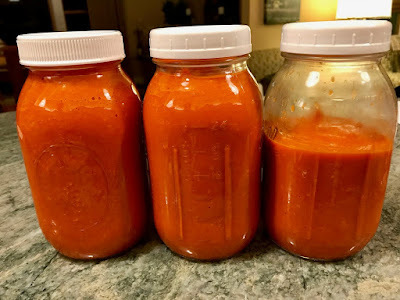 Pour the hot sauce into jars and refrigerate. It will last for over a year! Or pour into small bottles with a cute label and give them away as holiday gifts! Salsa Picante makes a yummy holiday gift!